Stromatolites (“layered rocks”) are structures made of calcium carbonate and shaped by the actions of photosynthetic cyanobacteria and other microbes that trapped and bound grains of coastal sediment into fine layers. They showed up in great abundance along shorelines all over the world about 3.5 billion years ago. 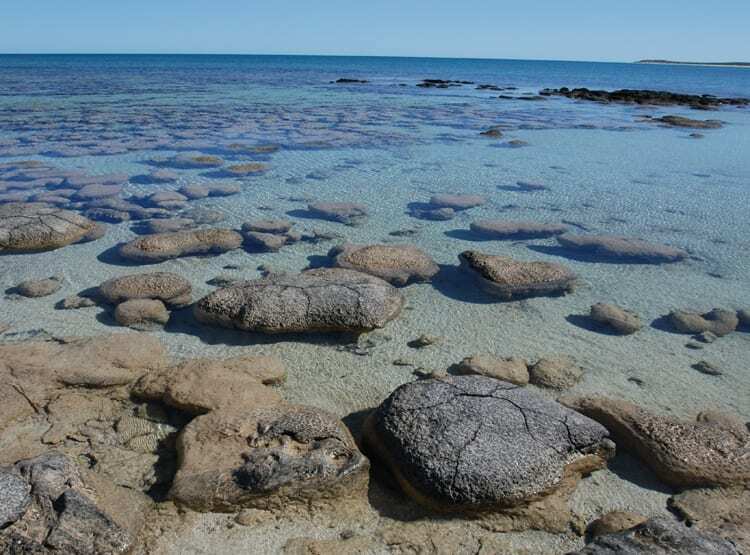 “Stromatolites were one of the earliest examples of the intimate connection between biology—living things—and geology—the structure of the Earth itself,” said WHOI geobiologist Joan Bernhard, lead author of the study. While the extinction of the dinosaurs has largely been explained by the impact of a large meteorite, the crash of the stromatolites remains unsolved. 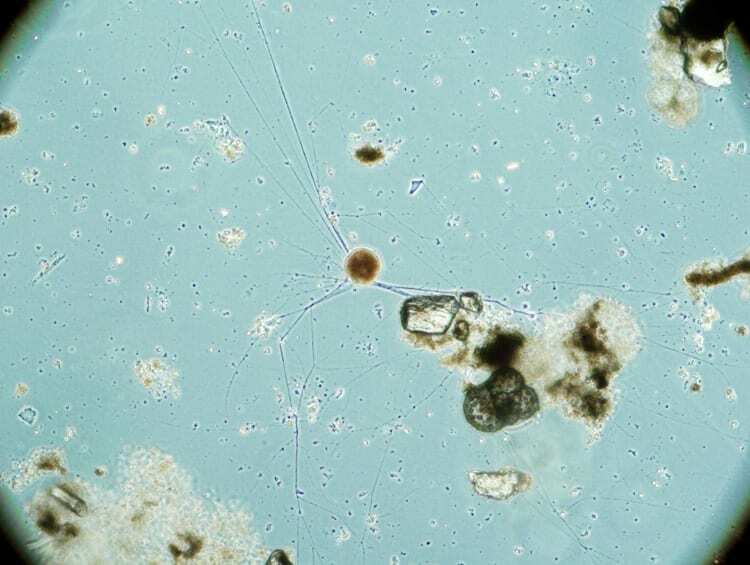 “It’s one of the major questions in Earth history,” said WHOI microbial ecologist Virginia Edgcomb, a co-author on the paper. The researchers examined modern stromatolites and thrombolites from Highborne Cay in the Bahamas for the presence of foraminifera. Using microscopic and rRNA sequencing techniques, they found forams in both kinds of structures. Thrombolites were home to a greater diversity of foraminifera and were especially rich in forams that secrete an organic sheath around themselves. These “thecate” foraminifera were probably the first kinds of forams to evolve, not long (in geologic terms) before stromatolites began to decline. After about six months, the finely layered arrangement characteristic of stromatolites had changed to a jumbled arrangement more like that of thrombolites. Even their fine structure, as revealed by CAT scans, resembled that of thrombolites collected from the wild. “The forams obliterated the microfabric,” said Bernhard. After about six months, the foraminifera were still present and alive—but the rock’s structure had not become more clotted like a thrombolite. It was still layered. Stromatolites, once widespread in coastal areas, now thrive in just a few locations in the tropical Atlantic and Indian Oceans and in some very salty lakes. The formations seen here are near Shark Bay on the western coast of Australia. The cyanobacteria in stromatolites live very near the surface of the rock, where they can receive the sunlight they need to photosynthesize. 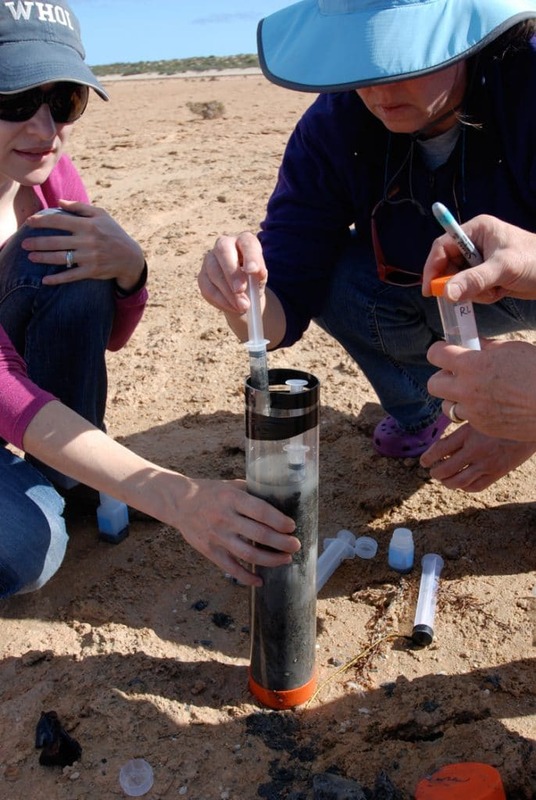 Postdoctoral investigator Anna McIntyre-Wressnig (left) and geobiologist Joan Bernhard of WHOI collecting mud samples near Shark Bay, Australia. Bernhard studies foraminifera in a variety of habitats, including oceanic sediments and stromatolites. 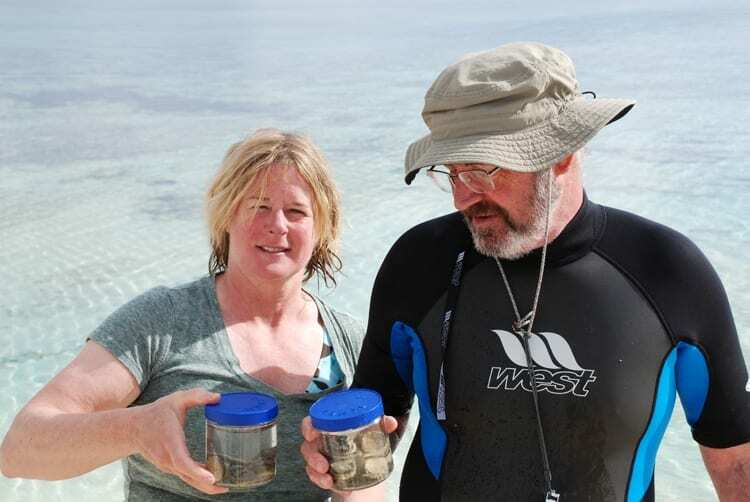 WHOI microbial ecologist Virginia Edgcomb and geobiologist Roger Summons of the Massachusetts Institute of Technology, co-authors of the current study, with samples of stromatolites they collected from Shark Bay, Australia. A living thecate foraminiferan, with a plump cell body and numerous thread-like pseudopods (extensions) that it uses to capture prey and explore its surroundings. Thecate foraminifera produce a soft, organic sheath around themselves. A calcareous foraminifer within a stromatolite from Highborne Cay, Bahamas. The hair-like structures are the foram’s pseudopods. 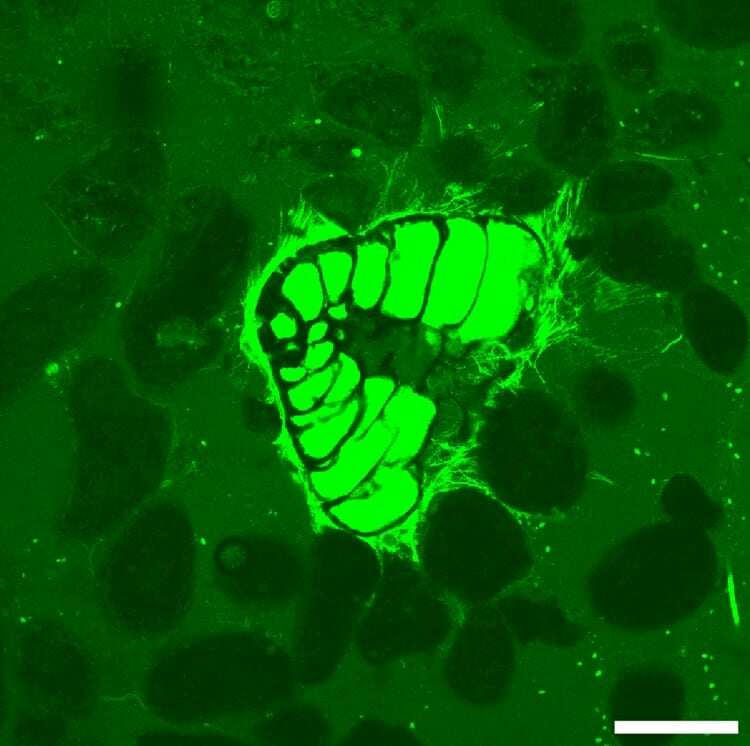 The organism appears bright green because it is labeled with CellTracker Green™.